When I was still somewhat ‘new’ to France, in 2007, I ate a meal at a restaurant along a medium sized port city in Normandy that concluded with an impressive cheese plate. The waiter hauled the thick wooden board over his shoulder and told us what all the different cheeses were, and allowed us to choose. In awe, I had to discreetly ask my dining partners to repeat the names of some of the cheeses. I had assumed they were all from Normandy, since the French are so attached to their regional cuisine (after all, this was following a meal of fish dishes in cream sauce served with rice and boiled potatoes…) To my surprise the cheeses came from all over the country, although the majority of them were from that dairy-farm-rich state along the sea. The fact that my dining partners could remember them all was just as impressive as the spread of cheeses itself. The round orange one wrapped in twine? Livarot. The whiter, square one that was being cut into elegant triangles? Pont l’Eveque. And the whitest creamy one that stood higher and firmer than the rest? Coulommiers. I couldn’t believe they remembered them all. But how? De Gaulle once famously remarked that it was impossible to govern a country with 365 different kinds of cheese, but how did everyone remember their names? I made a silent vow to myself to start to remember those cheeses, to know what kinds of milk they were made from and whether or not it was common to find raw-milk varieties. The fat contents were less important – except for the triple-cream beauties from Burgandy, like Brillat-Savarin, but the regions were vital in understanding the family tree of French cheeses. Some regions are more famous for their semi-mature aged cheeses with thick crusts that (most people) don’t eat, while others age their cheeses in beer or nut liquor. There was no clear-cut etiquette about how many cheeses one was expected to ask for off the board at a medium-range restaurant. Weight-minding women took one or two, most people took three, and burly men who had nothing to fear took four. I don’t think anyone had the gall to ask for five. The waiter expertly cut each sliver of cheese in whatever way was custom for that cheese, with whichever shape of knife was most appropriate. A year later, I celebrated Christmas with the same Norman family. Three days worth of hand-written dinner menus were displayed on the piano downstairs as folks arrived from all over northern France for an extended eating celebration. By day three, the cheese plate had finally dwindled itself down to one board, having been two fully packed boards on the first night. 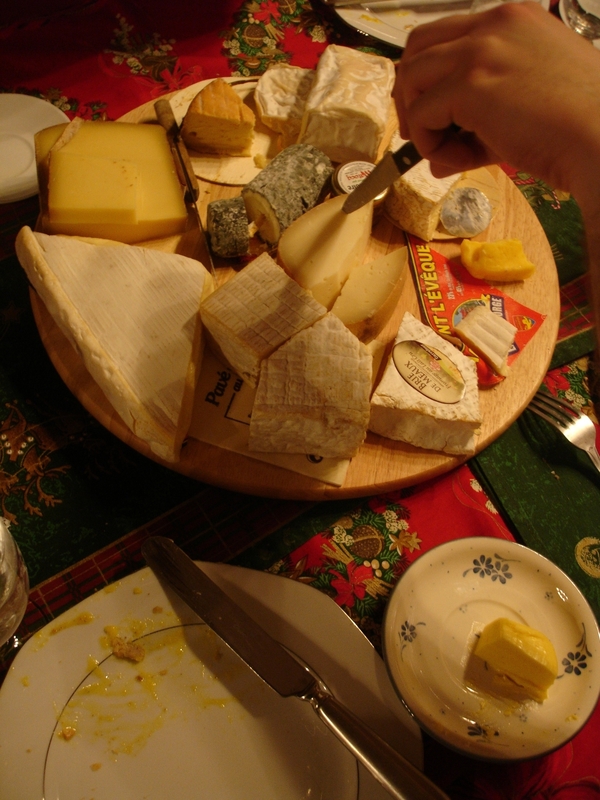 These days, the cheese plate in my apartment in Paris is just as much a staple as the board was at those meals. The cheese plate waxes and wanes as the weeks go by – the bag the cheeses are kept in will rotate depending on what cheese shop we went to last, whether or not we (or a friend) brought something creamy and delicious back for us from another region (the best Beaufort from the Alps, 36 month old Comté from the Jura, or ash-coated Sainte Maure de Touraine – which costs half the price in Tours as it does in Paris.) The cheeses shrink and grow, multiply, and sometimes, completely disappear – requiring a total refresh of the cheese plate. La Fermette, rue Montorgueil : specialties from Burgundy like Délice de Bourgogne, Soumaintrain, Brillat Savarin, Ami de Chambertin, and the dried figs stuffed with foie gras in December. Au Coeur du Marché, rue d’Aligre: the “hall of horrors” with very dried goat cheeses, specialties from various French regions such as that long chevre whose name I always forget, the lightly smoked brebis, and various English and Spanish cheeses. Autour du Fromage, rue de Charonne: for a St Félicien that is always perfectly ripe. Beillevaire, various locations around Paris: the Machcoulais, and other house-made productions from their dairy plant in the Vendée. Laurent Dubois, place Maubert: well known for the fact that he doesn’t only sell the cheeses, but ages them too, in the cellars below Paris’ 5th arrondissement.